Sanlorenzo has delivered the fourth hull in its 460 EXP series. The fourth 42.2 metre explorer yacht of the 460 EXP series features a grey hull and a total interior volume of 460GT, while the exterior styling comes from the boards of Florence-based designer Francesco Paszkowski. 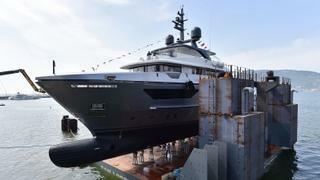 Sanlorenzo said the model has "innovated the concept of the luxury superyacht". The model enables owners "to experience an all-round adventure, without giving up on design, elegance and comfort," it added. The 460 EXP series began in 2016 with the launch of Moka and Sanlorenzo adds that there are a further three hulls under construction. It is understood that Hull 128 features accommodation for up to ten guests split between five cabins and a crew quarters suitable for a staff of up to eight people. Power comes from a pair of 1,320hp Caterpillar C32 ACERT diesel engines for a top speed of 16 knots and a cruising range of 5,000 nautical miles at 14 knots. Vital statistics include an 8.8 metre beam and a maximum draught of 2.45 metres. The interior was styled by the in-house team at Sanlorenzo. 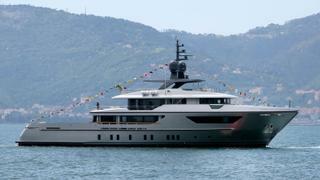 It comes after the yacht was launched in front of its European owners at the Sanlorenzo Superyachts facility in La Spezia earlier this year.